Leaning on a fabric-covered table and resting her head in her hand, this young woman looks out with an enigmatic expression. Since the Renaissance, artists have used this pose to portray melancholy. The pose, combined with her hauntingly unreadable face, gives a human poignancy and psychological tension to the figure. Juxtaposing bold, individual strokes of color, Paul Cézanne built up the woman's powerful physical presence and the space she occupies. 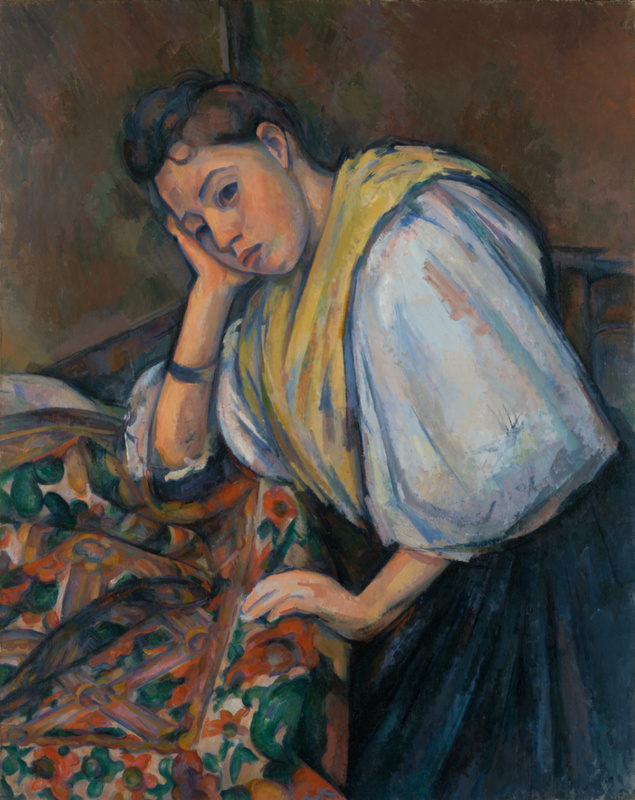 As a twentieth-century painter and admirer of Cézanne observed, his later works, such as Young Italian Woman, have "an enormous sense of volume, breathing, pulsating, expanding, contracting, through his use of colors." While the woman's form is convincing, the space behind and around her can appear contradictory and even confusing. How far away is the wall? Is the tabletop flat underneath the cloth? Does she sit or stand? These questions give tension and movement to an otherwise stable composition. From the 1890s until the end of his life, Cézanne painted a number of these grand figure studies, usually relying upon local workers or residents for his models. Paul Cézanne, French, 1839 - 1906, sold to Ambroise Vollard and Galerie Bernheim Jeune, 1904. Ambroise Vollard, French, 1867 - 1939 (Paris, France), purchased from the artist, 1904. and Galerie Bernheim Jeune (Paris, France), purchased from the artist, 1904; bought out shares from Ambroise Vollard, 1904. Galerie Bernheim Jeune (Paris, France), by exchange with Auguste Pellerin for another Cézanne and cash, 1904. Auguste Pellerin, 1852 - 1929, sold to Galerie Bernheim Jeune, 1912. Galerie Bernheim Jeune (Paris, France), sold to Ambroise Vollard, 1912. Ambroise Vollard, French, 1867 - 1939, sold to Mrs. Harry Bakwin, 1928. Dr. William Rosenthal (New York, New York) and Mrs. William Rosenthal (New York, New York), by inheritance to their heirs. Private Collection, sold through Sotheby's, New York, to the J. Paul Getty Museum by private treaty sale, 1999. Faure, Elie. "Paul Cézanne." L'art décoratif 26 (October 5, 1911), p. 113, ill.
Rivière, Georges. Le maître Paul Cézanne (Paris: H. Floury, 1923), p. 221. Pfister, Kurt. Cézanne: Gestalt / Werk / Mythos (Potsdam, Germany: Gustav Kiepenheuer, 1927), fig. 116. Alexandre, Arsène. "Portraits et figures de femmes: Ingres à Picasso." La renaissance 7 (July 1928), p. 277, no. 30, ill. Portraits et figures de femmes: Ingres à Picasso, exh. cat. (Paris: Galerie de la Renaissance, 1928), p. 12, no. 30. "Modern Art Museum Opens in New York." The Art News (November 9, 1929), p. 3, ill.
Watson, Forbes. "The Museum of Modern Art." The Arts (November 1929), p. 146, ill.
Cézanne, Gauguin, Seurat, Van Gogh, exh. cat. (New York: The Museum of Modern Art, 1929), p. 34, no. 8, ill.
Burrows, Carlyle. "Letter from New York." Apollo 2 (January 1930), p. 44, ill.
Neugass, Fritz. "Paul Cézanne." Creative Art (October 1931), p. 272, ill.
Bulliet, C. J. "A Century of Progress in Collecting." Parnassus 5, no. 4 (May 1933), cover ill.
Cézanne, exh. cat. (Philadelphia: Pennsylvania Museum of Art, 1934), unpaginated, no. 28. Iavorskaia, Nina. Paul Cézanne (Milan: Ulrico Hoepli, 1935), unpaginated, pl. 29. Venturi, Lionello. Cézanne: Son art, son oeuvre. 2 vols. (Paris: Paul Rosenberg, 1936), vol. 1, p. 216, no. 701. Bulliet, C. J. The Significant Moderns and Their Pictures (New York: Halcyon House, 1936), pl. 16. Guenne, Jacques. "Paul Cézanne et le drame de la peinture." L'art vivant, no. 204 (July 1936), p. 152, ill.
Huyghe, René. "Cézanne et son oeuvre." L'amour de l'art 17, no. 5 (May 1936), p. 177, fig. 62. Blanche, J. E., and Paul Jamot. Cézanne, exh. cat. (Paris: Musée de l'Orangerie, 1936), p. 115, no. 100. Venturi, Lionello. Cézanne: Son art, son oeuvre. 2 vols. (Paris: Paul Rosenberg, 1936), vol. 2, pl. 229, no. 701. "California Exhibits Cezanne: A San Francisco Retrospective of the Master of Aix." The Art News 36, no. 2 (October 9, 1937), p. 14, ill.
Novotny, Fritz. Cézanne (Vienna: Phaidon, 1937), p. 8, fig. 70. Vollard, Ambroise. Paul Cezanne: His Life and Art. Harold L. Van Doren, trans. (New York: Crown, 1937), pl. 17. Paul Cézanne: Exhibition of Paintings, Water-colors, Drawings and Prints, exh. cat. (San Francisco: San Francisco Museum of Art, 1937), p. 29, no. 34, ill.
Cogniat, Raymond. Cézanne (New York: French Library of Fine Arts, 1939), pl. 105. Cézanne: Centennial Exhibition, 1839-1939, exh. cat. (New York: Marie Harriman Gallery, 1939), no. 18. Pach, Walter, et al. Catalogue of European & American Paintings, 1500-1900 [...]; Masterpieces of Art, New York World's Fair, May to October, 1940, exh. cat. (New York: Art Aid Corporation, 1940), p. 236, no. 348. Jewell, Edward Alden. Paul Cézanne (New York: Hyperion Press, 1944), p. 37, ill. Paintings From New York Private Collections, exh. cat. (New York: The Museum of Modern Art, 1946), p. 4. Hayes, John T. A Loan Exhibition of Cézanne for the Benefit of the New York Infirmary, exh. cat. (New York: Wildenstein, 1947), pp. 58, 65, no. 61, ill.
Dorival, Bernard. Cézanne (Paris: Éditions Pierre Tisné, 1948), pp. 83, 138, 172, pl. 156. Jedlicka, Gotthard. Cézanne (Bern: Alfred Scherz, 1948), unpaginated, no. 47, ill.
Dorival, Bernard. Cézanne. H. H. A. Thackthwaite, trans. (New York: Continental Book Center, 1948), pp. 81, 133, 156, no. 152, pl. 152. Schapiro, Meyer. Paul Cézanne (New York: Harry N. Abrams, 1952), pp. 104-5, ill.
Storey, Benjamin. "Retrospettiva Cézanne." Emporium 115, no. 689 (May 1952), pp. 201-2, ill.
Cézanne: Paintings, Watercolors & Drawings, exh. cat. (Chicago: The Art Institute of Chicago, 1952), pp. 65, 69, no. 77, ill.
An Exhibition of Paintings by Cézanne Organized with the Edinburgh Festival Society by the Arts Council of Great Britain, exh. cat. (London: Tate Gallery, 1954), unpaginated, no. 56, pl. 12. Paul Cézanne: 28 Malerier, exh. cat. (Oslo: Kunstnerforbundet, 1954), p. 15, no. 24, ill.
Barr, Alfred H., Jr. "Paintings from Private Collections." The Museum of Modern Art Bulletin 22, no. 4 (Summer 1955), pp. 11, 30, no. 24, ill. Paintings from Private Collections: A 25th Anniversary Exhibition of the Museum of Modern Art, New York, exh. cat. (New York: The Museum of Modern Art, 1955), p. 8. Badt, Kurt. Die Kunst Cézannes (Munich: Prestel, 1956), p. 246. Paul Cézanne, 1839-1906, exh. cat. (The Hague: Gemeentemuseum, 1956), unpaginated, no. 44, ill.
Exposition pour commémorer le cinquantenaire de la mort de Cézanne, exh. cat. (Aix-en-Provence: Pavillon de Vendôme, 1956), unpaginated, no. 54, ill.
Paul Cézanne, 1839-1906, exh. cat. (Munich: Haus der Kunst, 1956), unpaginated, no. 57, ill.
Paul Cézanne, 1839-1906, exh. cat. (Zurich: Kunsthaus, 1956), p. 29, no. 72, fig. 36. Cézanne: Ausstellung zum Gedenken an sein 50. Todesjahr, veranstaltet vom Wallraf-Richartz-Museum Köln im Kunsthaus Lempertz, Dezember 1956-Januar 1957, exh. cat. (Cologne: Wallraf-Richartz-Museum, 1956), pp. 50-51, no. 27, ill.
Schapiro, Meyer. Cézanne: Loan Exhibition [...] for the Benefit of The National Organization of Mentally Ill Children, exh. cat. (New York: Wildenstein, 1959), unpaginated, no. 45, ill.
Collectors' Firsts, exh. cat. (Atlanta: Atlanta Art Association Galleries, 1959), no. 33, ill. Masterpieces of Impressionist and Post-Impressionist Painting, exh. cat. (Washington, D.C.: National Gallery of Art, 1959), p. 31, ill. Treasures in America, exh. cat. (Richmond: The Virginia Museum of Fine Arts, 1961), p. 84, ill.
Masters of Seven Centuries: Paintings and Drawings from the 14th to 20th Century; Loan Exhibition for the Benefit of the Wellesley College Faculty Salary Advancement Fund, exh. cat. (New York: Wildenstein, 1962), pp. 18, 40, no. 34, ill.
Feist, Peter H. Paul Cézanne (Leipzig: E. A. Seemann, 1963), pp. 34, 38, 54, 76, pl. 59. Olympia's Progeny: Loan Exhibition [...] for the Benefit of The Association for Mentally Ill Children in Manhattan, Inc., exh. cat. (New York: Wildenstein, 1965), unpaginated, fig. 74. Badt, Kurt. The Art of Cézanne. Sheila Ann Ogilvie, trans. (London: Faber and Faber, 1965), p. 314. The Dr. & Mrs. Harry Bakwin Collection: An Exhibition of Paintings and Sculpture for the Benefit of The Association for Mentally Ill Children in Manhattan, Inc., exh. cat. (New York: Wildenstein, 1967), p. 16, no. 7, ill.
Elgar, Frank. Cézanne (London: Thames and Hudson, 1969), p. 136, fig. 82. Orienti, Sandra, and Alfonso Gatto. L'opera completa di Cézanne (Milan: Rizzoli, 1970), p. 113, no. 592, ill.
Orienti, Sandra, and Ian Dunlop. The Complete Paintings of Cézanne (London: Weidenfeld and Nicolson, 1972), p. 113, no. 592, ill.
Orienti, Sandra, and Gaëtan Picon. Tout l'oeuvre peint de Cézanne (Paris: Flammarion, 1975), p. 113, no. 592, ill.
Rubin, William, ed. Cézanne: The Late Work, exh. cat. (New York: The Museum of Modern Art, 1977), pp. 217, 388-89, no. 7, pl. 9. Reff, Theodore. "Painting and Theory in the Final Decade." In Cézanne: The Late Work, exh. cat. William Rubin, ed. (New York: The Museum of Modern Art, 1977), pp. 13, 14, 15, 18. Gabhart, Ann, et al. One Century: Wellesley Families Collect; An Exhibition Celebrating the Centennial of Wellesley College, exh. cat. (Wellesley, MA: Wellesley College Museum, 1978), unpaginated, no. 15, ill.
Cowling, Elizabeth, and Jennifer Mundy. On Classic Ground: Picasso, Léger, de Chirico and the New Classicism 1910-1930, exh. cat. (London: Tate Gallery, 1990), p. 70, no. 29, ill.
Naubert-Riser, Constance. Cézanne (Paris: Hazan, 1991), p. 94, under no. 26. Adriani, Götz, ed. Cézanne Gemälde, exh. cat. (Tübingen: Kunsthalle, with DuMont, 1993), p. 229, under no. 77, fig. 1. Cachin, Françoise, et al., eds. Cézanne, exh. cat. (Paris: Galeries nationales du Grand Palais; Éditions de la réunion des musées nationaux, 1995), p. 446, under no. 188, entry by Françoise Cachin. Rewald, John, Walter Feilchenfeldt, and Jayne Warman. The Paintings of Paul Cézanne: A Catalogue Raisonné. 2 vols. (New York: Harry N. Abrams, 1996), vol. 1, pp. 489-90, no. 812. Rewald, John, Walter Feilchenfeldt, and Jayne Warman. The Paintings of Paul Cézanne: A Catalogue Raisonné. 2 vols. (New York: Harry N. Abrams, 1996), vol. 2, p. 283, no. 812, ill.
Sotheby's, New York. Ten Paintings by Paul Cézanne Formerly in the Auguste Pellerin Collection. November 13, 1997, p. 13. Schaefer, Scott, and Jennifer Helvey. "A Cézanne for the Getty." Apollo 151, no. 455 (January 2000), p. 35, ill. The J. Paul Getty Museum Handbook of the Collections. 6th ed. (Los Angeles: J. Paul Getty Museum, 2001), p. 141, ill., cover ill.
Athanassoglou-Kallmyer, Nina Maria. Cézanne and Provence: The Painter in His Culture (Chicago: University of Chicago Press, 2003), pp. 140-47, fig. 3.45. Allen, Denise, et al. Masterpieces of Painting in the J. Paul Getty Museum. Rev. ed. (Los Angeles: J. Paul Getty Museum, with Thames & Hudson, 2003), pp. 108-9, no. 58, ill., entry by Charlotte Eyerman. Armstrong, Carol, ed. Cézanne in the Studio: Still Life in Watercolors, exh. cat. (Los Angeles: J. Paul Getty Museum, 2004), pp. 62-63, fig. 28. The J. Paul Getty Museum Handbook of the Collections. 7th ed. (Los Angeles: J. Paul Getty Museum, 2007), p. 143, ill.
Rishel, Joseph J., et al. Cézanne and Beyond, exh. cat. (Philadelphia: Philadelphia Museum of Art, 2009), p. 135, fig. 4.16. Lanchner, Carolyn. Paul Cézanne (New York: The Museum of Modern Art, 2011), pp. 35, 37, fig. 13.